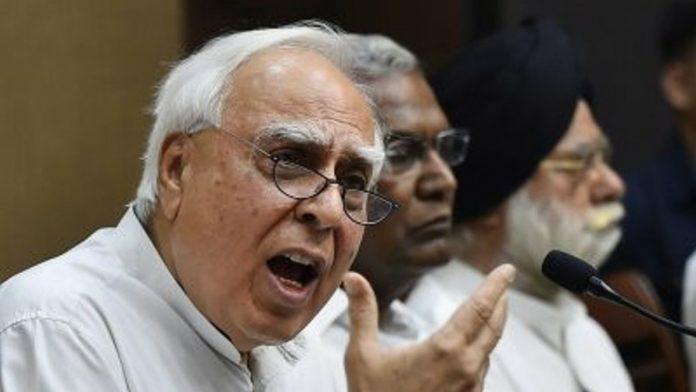 BJP has used Kapil Sibal’s presence at the ‘EVM hacking’ press conference in London Monday to attack the Congress for orchestrating the event. New Delhi: At a press conference in London Monday, a US-based ‘cyber expert’ who claimed to have worked on electronic voting machines in India levelled various charges against the BJP, including the allegation that the 2014 general elections were rigged, but failed to produce any evidence. However, it is not the BJP but the opposition Congress that has been left red-faced, owing to the presence of its senior leader Kapil Sibal at the event. The BJP has not only questioned his presence, but claimed that the Congress had a major role to play in the event, which was organised by the Indian Journalists’ Association (Europe). Congress spokesperson Abhishek Manu Singhvi denied the BJP’s charges, saying his party had nothing to do with the event, and that Sibal attended it in his personal capacity on the invitation of a journalist, and was not representing the Congress. And yet, once again, Sibal has managed to put the Congress on a sticky wicket. Amid campaigning for the 2017 Gujarat assembly elections, Sibal, a senior advocate, had urged the Supreme Court to defer the hearing on the Ayodhya title suit until after 2019 Lok Sabha elections as the verdict could have a bearing on the polls. The Congress was left distancing itself from Sibal, but Prime Minister Narendra Modi pounced on his remarks to make the Ram temple an election issue. Even recently, Modi accused the Congress of delaying the resolution of the Ram temple issue, indicating that the BJP would continue to use Sibal’s stand in court to counter charges of the NDA government’s inaction on the temple. Last year too, even as Congress president Rahul Gandhi kept hitting out at Modi for “favouring” industrialist Anil Ambani in the Rafale deal, Sibal managed to blunt his own party’s attack by appearing for the younger Ambani brother in a case related to selling assets of his company, Reliance Infocomm Ltd, to his older brother Mukesh Ambani’s Reliance Jio. As the BJP criticised this, the Congress maintained that Sibal had represented Ambani as a lawyer, which is his profession. In April 2018, Sibal had also spearheaded the move to impeach Chief Justice of India Dipak Misra. However, Rajya Sabha Chairman Venkaiah Naidu rejected the motion for impeachment helmed by Sibal and signed by 65 MPs on the grounds that they were mere allegations. Not only this, he went on to say that those who had made the allegations were not even sure of them. Sibal later also favoured the petition moved in the Supreme Court by two Congress MPs against Naidu’s ruling. However, in May 2018, he withdrew the petition. Even in 2011, when the UPA was in power and Sibal was telecom minister, he had come up with the ‘zero loss theory’ to rebut the CAG report estimating the loss to the exchequer in the allocation of the 2G spectrum at Rs 1.76 lakh crore. The statement had added fuel to the raging 2G scam fire, though, to be fair, Sibal was vindicated in 2017 when a special court acquitted all the accused. Photoshop ka bjp ke looterono acha upyog kiya aur janata ku photo pe vishwas dilane selfi ka movement chalaya. Kapil sibal ne kaha foreign ministry,home ministry sabut bataye . Bjp ke ministers ko bakna aata hai bakte hai magar proof nahi batate. Modi kitna sikhle ab koi faida nahi. Iska bashan rss ki pathashala ki padayi ko batata hai ke kaise aag zaher ugla jaye. Ye kaisa CM pad pe baita ye malum hojaye to kafi hai. Kapil Sibal and Congress thought they would get a good mileage ahead of the general election. Happy to note they were made to cringe and crawl post the idiotic event. For rogue opponents like FENKU TADIPAR JOOTELY & JUMPING JACK PRASAD THE LAW MIN Sibbal is a Must requirement.